Paris is gearing up for a major week long residency by Hélène Grimaud which runs from 1 – 6 November with four different concerts at La Salle Pleyel and Cité de la Musique. For this unique “Domaine Privé” Hélène will be joined on stage by two of Europe’s elite orchestras (the Accademia Nazionale di Santa Cecilia and the Bayerische Rundfunk Kammerorchester) for performances of Brahms, Mozart and Bach whilst, for her closing concert, she has chosen to end with an intimate programme of chamber music with the cellist Jan Vogler. Grimaud-maniaHélène Grimaud, pianisteaux multiples facettes. Crédits photo : Mat Hennek/DG/Universal Classics Elle fascine ou déconcerte, déchaîne les passions contre ou à travers elle, enchante ou désenchante. Mais c'est le même engouement du public et la même aura poétique qui cernent chaque rendez-vous honoré avec la star Hélène Grimaud. Hélène will talk about the new album on Radio Stephansdom. This album marks two ‘firsts’ for Hélène Grimaud – her first live DG recording and her first ever Mozart concerto recording. The album is the culmination of a musical love affair which began two years ago when the French pianist played Bach with the Kammerorchster des Symphonieorchesters des Bayerischen Rundfunks (Chamber orchestra of the Bavarian Radio Orchestra). From the beginning there was a very special chemistry and musical understanding. In May this year Hélène Grimaud returned to Munich to play Mozart with the orchestra led by her from the piano, in collaboration with the concert master Radoslaw Szulc. The pianist was so excited by the concerts that she was inspired to release this live recording. “Bach or wolf enclosure, Echo Klassik, Schumann or Chopin: This woman can not be topped. 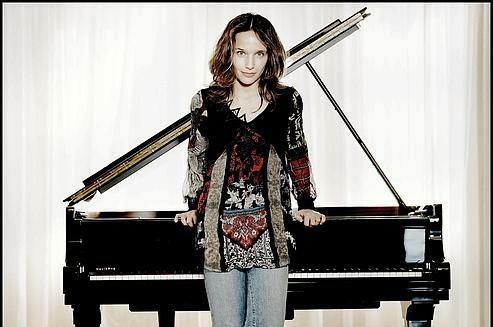 Helene Grimaud can sometimes be heard at Berlin’s summer Waldbühne or seen alongside ZDF’s top rating Thomas Gottschalk. And she is beautiful and smart. Born in Aix-en-Provence in 1969 she has been portrayed as a glossy media artist … But Hélène Grimaud is more than just a show – as she and her new album ‘Resonances’ proves just that.